First off, we have The Loving Spirit by the wonderful Daphne du Maurier. I love du Maurier and I will forever be in debt to the friend that introduced me to her. This book was her first novel and it has only 578 ratings on goodreads. 578! I’ve wanted to read more du Maurier for a long time and given that only 4 of her works have OVER 5000 ratings this seems like an opportune time to pick up one (or in my case two) of her works. The second book I’ve picked is The Birds and Other Stories again by du Maurier, this has 2969 ratings on goodreads and I’m feeling in the mood for a short story collection. I adored the last short story collection I read by du Maurier and have been wanting to pick this one up for an age. 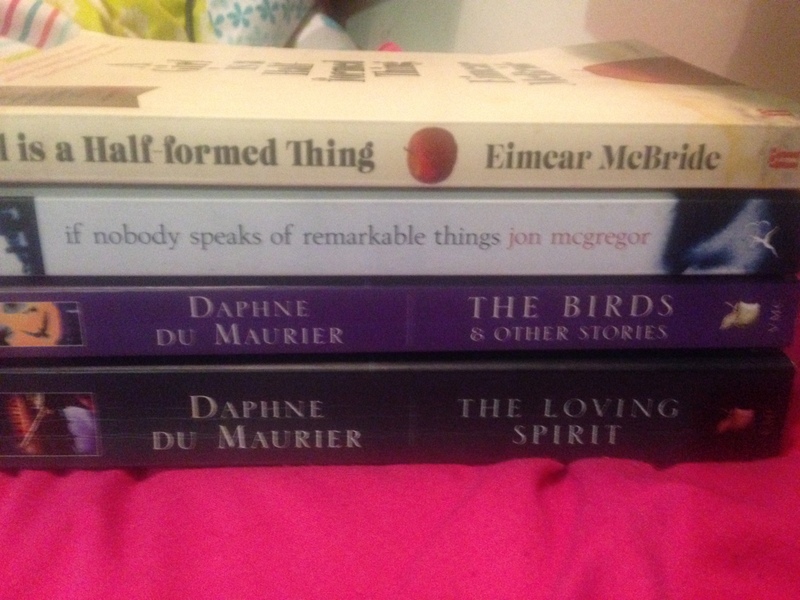 I’ve heard that when readathoning, a short story collection is often a good way to fill space so I thought why only read one du Maurier this week when I could read two? Next is Jon McGregor’s If Nobody Speaks of Remarkable Things which I bought in September when Sar came to visit and it comes highly recommended. It has 4284 ratings on gooreads and is the highest rated of all the books I’m hoping to read this week. I’m going in to this completely blind, all I know is that one of my best friends loves it and that’s good enough for me! Finally is A Girl is a Half-Formed Thing by Eimear McBride. This was actually originally published by one of my local independent book shops and only came on to my radar when the woman who runs another bookshop mentioned it to me; I immediately snapped it up and I’ve been putting it off and off for months. It has a total of 2012 ratings on goodreads and yeah, it’s not something I would have picked up by myself so I’m looking forward to it! So ultimately, it an be said that I’m crazy. Completely stark raving bonkers even. This isn’t going to be easy but I’ve finished almost all of my coursework that’s due and it’ll be a week or so before I’m given anything new so I’m going to be taking advantage of a bit of free time I have and just reading! All books will be reviewed but I’m going to stagger them slightly as to not clog up timelines. I’m keeping my fingers crossed that I can achieve this – if I could I’d feel amazing!